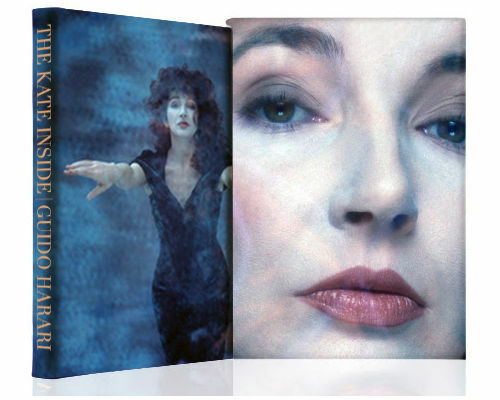 Book published in March 2016, featuring photographs of Kate Bush by Guido Harari. Guido photographed Kate between 1982 and 1993, while she was involved in her albums Hounds Of Love, The Sensual World and The Red Shoes and the film The Line, The Cross & The Curve. The book was limited to 3000 copies worldwide. The deluxe edition was limited to just 350 copies, all personally signed by both Guido and Lindsay Kemp, who has also written a special foreword for the book. The deluxe edition had a full leather cover and featured extra pages. It also included a 24x30cm (10”x11”) signed/numbered fine art pigment print and a set of 8 replica Polaroids (10x15cm/3”x5”, unsigned and non editioned). These are replicas of the actual Polaroids used by Guido with Kate on the 1985 and 1989 shoots.